The clients asked us to create something which would give privacy and separation between their bedroom area and the rest of the very open loft area while at the same time allowing some sense of light to come through from the street-facing windows. Our solution was to create a large sliding wall, which when open would obscure vision of the existing office area and book shelves, and when closed would create a complete visual and acoustical enclosure. 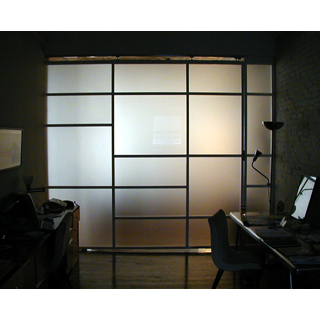 The 9-0 x 10-0 panel is constructed of a lightweight frame and clad on both sides in matte acrylic panels.